LoL 3e: More Champs! Udyr, Maokai, and Nunu! In a world far away where an ancient war still rages, Kayle was a great hero - the strongest of an immortal race committed to destroying evil wherever it could be found. For ten thousand years, Kayle fought tirelessly for her people, wielding her flaming sword forged before time itself. She shielded her delicate features beneath her enchanted armor, the sole remaining masterpiece of an extinct race of craftsmen. Though a beautiful, striking creature, Kayle, now as then, avoids showing her face; war has taken a terrible toll upon her spirit. In her quest for victory, she sometimes would try to lift the wicked up from their morass of evil, but more than often she instead purged those she herself deemed beyond redemption. To Kayle, justice can so often be an ugly thing. Ten years ago, Kayle's war against evil was nearly won... until her rebellious sister Morgana, a pariah amongst their people, suddenly gained powerful new allies: magicians of a hitherto unknown world called Runeterra. Morgana traded servitude to a number of the summoners in Runeterra's League of Legends for powerful new abilities that, if mastered, threatened to bring Kayle and her people to their knees. To save her world, Kayle had no choice but to make a pact with the League herself. She approached the leader of the League, High Counselor Reginald Ashram, with a deal of her own. 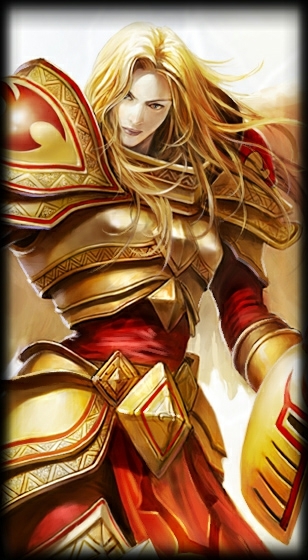 In exchange for a thousand years of Kayle's service, Ashram halted all League interference on Kayle's world. With Ashram's disappearance five years ago, Kayle has new causes on Valoran: find out who or what caused Ashram to disappear, defeat her sister Morgana upon the Fields of Justice, and bring her own brand of justice to the League of Legends. Responsibility: She is fighting for the League to protect her people. Created With Hero Lab® - try it for free at http://www.wolflair.com! And kontinuing on through the k's, it's Kayle! Another melee fighter, but in the tradition of Samus Aran, a women geared like a tank. She's also essential a paladin of an angelic-esque race, with a foil in sister Morganna. I started off using the Mystic Knight template for Kayle, but in the 11th hour I realized there's an angel template in the Book of Magic, which was close enough that I didn't have to change her attributes at all, just scrambled her Advantages around. I did keep the armor and sword devices from the Mystic Knight, and even used the Easily Removable on all of Kayle's spells, so effectively they are all tied to her sword. This was done mainly to save points, but it makes her a little more vulnerable than I like - one disarm and she offensively drops to PL6. On the angel side I gave her an Age Immunity and very watered down flight. LoL movement speeds never really go past rank 1 except in very specialized circumstances and short bursts, and Kayle's flight doesn't give her any additional mobility in-game, unlike say Janna (LoL's Stormalogue, who probably won't show up this month), but the wings needed addressing and giving them a Glide component kept them interesting without becoming too combat effective. Reckoning is a basic ranged damage+slow attack, but the nuance of this spell is the damage bonus on Reckon-slowed targets. I considered using Flawed bonus damage, but then it would break PL. I figured an Improved Critical vs Reckoned Targets using any attack would essentially work out to the same cost. The based Mystical Blade already has some ImpCrit on it, so I may changed a rank from Swords to Reckoned. Divine Blessing is almost exactly the equal opposite of Reckoning, a ranged heal+speed bonus effect. As mentioned before, too much speed breaks the limits of the game, so instead of adding Speed and Fading it, I decided to make it a Fading Athletics bonus, allowing a minor speed boost as well as a few other tricks. Righteous Fury is a relatively straightforward Ranged Attack with a half-rank Burst to simulate splash damage, but it is built by adding damage ranks and partial AoE to the MBlade, so it looks a little messy. The Stack didn't quite translate through, since an RF Attack should be Rank 12 damage on target with 6 in the splash. I wanted Intervention to be a full Toughness Immunity with proper flaws, but making it ranged made it a little too expensive, even after putting on the Tiring Flaw as per usual for Ultimates. 15 ranks of ImpProt should do for now. Last edited by JDRook on Tue Mar 08, 2011 2:54 pm, edited 2 times in total. Sorry, I can't hear your argument for realism over the sound of my eye beams. Whaddaya mean it's a GIRL? There is a world far away where an ancient conflict still rages. Like so many wars, this war split families. One side called themselves angels, claiming to be beings of perfect order and justice. Those that fought against them believed the angels to be tyrants, creatures incapable of seeing the larger view. Morgana was one who fought against what she perceived as the tyranny of the angels, and for that she was branded ''fallen''. Morgana was not innocent, having taken to the practice of the black arts in an effort to fight against the general of her enemy's army - her sister, Kayle, who had long ago disavowed any filial connection. Then, as the two were locked in what might be their final conflict, they were suddenly summoned to Valoran. Morgana now fights in the League of Legends, but only with the goal of destroying her sister before returning home. And the evil angel sister who isn't afraid of showing her feminine attributes. Yet another mage but like her tanky sister, better at support. Statted her using the Mystic base, was tempted to add in the Angel template stuff, but Mystic hits most of the highlights. I did give her the angel package of Age Immunity and wings, though. Dark Binding I decided to make particularly powerful by making it a little Innaccurate. This is balanced out by the Accurate Attack advantage. Tormented Soil, while not initially powerful, is a great softening attack, giving a few Toughness penalties and weakening Will. I slowed down the Weaken to keep it from being too powerful but also having effect every round. It basically encourages opponents to GTFO of the AoE. Black Shield is actually going to slow me down for a bit, not because it was particularly difficult to stat, but because it's made me realize that I'm going to have to go back and define my descriptors for ALL of my builds. I'll have to differentiate between Magic and Physical damage, as well as deciding just what a "disable" is in LoL-speak so that Black Shield can be effective against it. Presumably, disables are mainly Afflictions, but probably on 2nd or 3rd tier effects. I'll work this out soon. Last edited by JDRook on Tue Mar 08, 2011 4:38 pm, edited 1 time in total. Saltcrow wrote: Whaddaya mean it's a GIRL? Look at that silhouette, that narrow waist. It's so obvious! Of course, you may be confused by years of sexually ambiguous anime heroes. It's completely understandable. Oh well. I suppose it's nice to see a broad-shouldered female warrior once in a decade. I've updated the index to list all of the Champions that I currently own (I broke down and bought both Champion bundles) and therefore am most likely to stat. I may do a few others when I play them in rotation, or am moved to buy more. Also, as a point of honour, I'm going to try to get at least one Champion posted for every 100 views or 5 posts, as those are currently my best gauges of community interest of the project. Of course if it looks like spamming I'll probably just change my conditions. JDRook wrote: I've updated the index to list all of the Champions that I currently own (I broke down and bought both Champion bundles) and therefore am most likely to stat. I may do a few others when I play them in rotation, or am moved to buy more. There is a place between dimensions, between worlds. To some it is known as the Outside, to others it is the Unknown. To those that truly know, however, it is called the Void. Despite its name, the Void is not an empty place, but rather the home of unspeakable things - horrors not meant for minds of men. Cho'Gath is a creature born of the Void, a thing whose true nature is so awful most will not speak its name. Its fellows have been poking at the walls that divide dimensions for a crack, a way into Runeterra, where they can visit their own personal paradise of horror upon the world. They are called the Voidborn, creatures so ancient and terrible that they have been removed from history altogether. It is rumored that the Voidborn command vast armies of unspeakable creatures on other worlds, that they were once driven from Runeterra by powerful magic lost to antiquity. If such tales are true, then the rumors that follow must be equally true - that one day, the Voidborn will return. Even now, something dark stirs in Icathia, perverting the summoning rituals of the League to allow the presence of Cho'Gath. It is an alien creature of malice and violence, a thing that causes all but the most stalwart to cringe in fear. Cho'Gath even appears to feed on its predations, growing and swelling as it gorges itself. Worse yet, the creature is intelligent, perhaps greatly so, making most wonder how such a monster could be contained. Fortunately, the power of the League's summoning has confined Cho'Gath's presence exclusively to the League of Legends. It is here that summoners use Cho'Gath's Voidborn abilities to help decide the fate of Runeterra. The Terror of the Void knows what fate it would choose for Runeterra, given half the chance. Woe betide the day when Cho'Gath grows weary of the League. Weakness: The sunlight! IT BURNS! Cho'gath is obviously a pretty unusual character, even among this motley crew of Champions. Design-wise, I think he may be the least humanoid of the bunch, and he's the only mage-type character who's better in melee. A fun, alien-style character - if the gobbling noise he makes Feasting on a minion, let alone a weakened Champion, doesn't make you smile, you just have no soul. Since he is so unusual, I went to the boards for a good template to abuse, and that was Baron's Xenomorph build. Admittedly, Cho is more about shock & awe than sneaky speed, but the basics are close enough to tweak from. Because of this I've dropped his Agi/Dex/Fgh a little and bumped up his Int and defenses. The rest is covered by his Voidborn Physiology and Growth from Feast (see below). Skills and Advantages are still pretty simple and animalistic. I'm thinking about swapping in some more mage-y stuff, but his points are already pretty high. His Spell abilities are a little crazy, and tricky to make fit into an array like I have with most other Champions. The two easiest are Rupture and Feral Scream, both big damage/affliction AoE attacks, one ranged and one close. The others could just as easily be outside the array, and arguably should be. Rupture is the Ranged Burst damage/slow, knocking opponents in the air very much like a ranged Pulverize (Alistar), excellent for softening targets, particularly big groups, and for chasing down weakened Champs. Feral Scream is a Close Cone damage/silence attack. Silencing as an Affliction was discussed in another thread and my interpretation on it is 3 tiers of Speaking: Impaired, Disabled, and Unaware translating to rank penalties of -2, -5 and Unusable, respectively, for target's ability to spellcast. Since spells are so common as to be ubiquitous in a LoL setting, I figure this works well without being too effective or cheap. I'm debating whether giving a hero point to a fully muted target would be appropriate. Vorpal Spikes is kind of a "faux" range attack, a Close Line damage effect linked to melee. In-game, it's a toggle effect with no mana cost, and since it can't harm allies I can't think of a single in-play situation where turning it off is a good idea, so it really should exist outside the array. In current form it shares a slot with Feral Scream, which works for numbers and fits with the close ranged AoE theme. Cho'Gath's ultimate, Feast, means Growth, and non-persistent Growth is usually a PITA to deal with, since it throws PL for a loop. Since I've flawed the Growth to be very conditional, though, I don't think it will be too unbalancing in this case. Feast does a huge chunk of Close Damage and only activates 1 rank of Growth if the target is killed (or incap'd, for our purposes). Originally I was going to use a Snare/Engulf variation adapted from 2e to simulate the Grab before the eating, but simply making the attack Grab-based is more straightforward. It's tempting to let it all be a maneuver and just use the Claws/Teeth to cover damage rank. (And as a sidenote, Cho's extra limbs make grabs very effective.) Cho dials his offensive PL to 11 if he manages to get to full size, but since that requires him to eat 5-6 targets, I don't think he's game-breaking. (If his opponents don't figure out he's getting bigger by the time he eats the 3rd one, they're probably already doomed. ) I've marked his affected Abilities, Skills and Defenses at the base and full sizes, but he'll usually be hovering around the middle. In-game, Cho loses 3 sizes upon death, but just making it Sustained means he loses all Growth when unable to use free actions, so I could give him a Quirk to cover that, but it hardly seems worth 1 point. Lastly, this is the only Ultimate I've made so far that I haven't given Tiring, partly because Feast actually has a pretty fast cooldown for an ulti, and partly because Attacking after Grabbing in the same round already costs Extra Effort, so the limit is built in sufficiently. Carnivore as the passive is what lets Cho really survive well. I made the Heal low rank but Reaction based on unit kills, so it's relatively inexpensive but difficult to abuse. It really shines with solid AoEs on crowds of minions. Looking back over this, Cho'Gath is going to need all kinds of tuning. It's a bit of a mess, and I'm open to suggestions. Last edited by JDRook on Sat Mar 12, 2011 4:13 pm, edited 1 time in total. JDRook wrote: :arrow: Stats Coming Soon! Edit: nice Cho'gath! I'll look forward to your next character! Keeper of the ancient art of Wuju, Master Yi is a mystical warrior from the isle of Ionia. He descended from one of the few tribes dedicated to the preservation of Wuju, a martial art founded with the principles of absolute spiritual awareness of one's self and one's enemy. When the armies of Noxus invaded Ionia, Master Yi joined in the Ionian defense to fight the craven enemy, bringing his village honor through his unparalleled mastery of the blade. The ensuing battles ravaged the land, but no conflict inflicted as much horror as the day the armies of Noxus closed in on Yi's village. Left undefended, the village became the unfortunate test subject of the latest invention by an up-and-coming chemist, now known as Singed. The remains of the village that Master Yi returned to were so horrific that it remains a festering scar on Ionian history. To this day, no Ionian will ever publicly speak of what occurred. After the Noxian invasion was contained, Master Yi fell into a deep isolation. For years, he trained morning to night, speaking to no one and refusing offers of consolation by fellow Ionians. The only thing stopping him from madly charging into Noxus battle lines headfirst was his pledge to keep the Wuju style alive. Even though he seethed with impatience, his rage became a tool for sharpening his practice of Wuju, developing stronger and deadlier skills for his eventual vengeance. The only thing that roused him was news of the League's formation, and Noxus's subsequent enrollment in the League. Master Yi now brings his mastery of the blade to the League of Legends with unflinching purpose: to avenge his kinfolk and end the predations of the Noxus once and for all. Enemy: The Noxians in general, Singed in particular. Master Yi is a fantastic little slicer-dicer character, a melee type with good goonsweeping abilities and some serious assassinating skills late game. Between his fast blades and healing factor, I'm waiting for Riot to come out with his Wolverine skin. I used the Weapon Master as a template for him, including buying the sword as Equipment. There's no real Disarm ability in LoL, so this may be something that would need adjusting depending on your setting. I dropped his DEX as well since he has no real ranged abilities either, just close AoEs, although I generally like my Agi/Dex to keep some relation, so I didn't zero it out completely. Skills and Advantages were trimmed down for the setting (ie no Vehicles skill, no Connected adv, etc) with a few of them turned into Enhanced in the Powers section. Yi's Spell Abilities overlap each other and stack a lot of effectiveness, giving him some PL-breaking capabilities with the right synergy. To allow for this, most of his abilities are non-arrayed. Alpha Strike and Meditate are arrayed together partly because it makes sense they can't be used together and partly due to being the most expensive effects. Alpha Strike targets one character at range, hitting that target plus up to 3 other nearby targets, with Yi ending his attack next to his main target. In-game, main is chosen but the rest are random, but I allowed for the attack itself to be a Selective Burst around the main, flawed for the limit of 3. In normal games, that flaw should probably be a quirk, but since a large part of the advantage of Selective is not hurting allies and the LoL setting essentially applies that globally already, it kinda works out. I chose Teleport as his movement since it doesn't look like he can be stopped by anything once AlStrike fires, although apparently effects will engage once he lands. One could almost simulate this power cheaply with Takedown, Move-by and some bonus damage, but I liked this setup and it allowed for easy PL10 capacity. Oh, and there's also a chance of bonus Minion damage, so I had an Improved Crit bonus vs minions just for this effect, although it may not really be necessary. Meditate makes Yi a viable lane soloer, able to heal back damage while essentially throwing up a personal force field. Regen 10 kept it simple (1 bruise per round gone), Force Field 14 Imperv is very effective, but not insurmountable, and Concentration uses up standard actions so Yi can't attack. I also put in a custom Flaw so that he's immobile and defenseless, so his active defenses would be zero but his Toughness would be 20 + 14 Imperv, completely ignoring rank 7 or less attacks, all without breaking PL10. Wuju Style gets Yi to hit his offensive caps, and surpass them. (With just his blade, Yi attacks at PL9) Wuju gives a passive damage bonus that can be doubled for a short period in exchange for losing it until the end of cooldown. Mechanically, it's somewhat similar to the old Rage feat in 2e, giving bonus strength for 5 rounds balanced by 5 rounds of fatigue. 3e fatigue isn't as bad and Rage doesn't exist anymore, so I went with the conversion PDF suggestion of Flawing it with Fades. Since it's an array, the passive is the base power and the active only really gives you a bonus for two rounds, and then the array should be considered defunct until the GM thinks it's recharged (probably a minute of noncombat, maybe less, or possibly 5 rounds of Meditation). So with the passive, Yi hits PL10 offensively, and when active reaches PL11 for a few rounds and then drops back down to 9 for a bit. Highlander is surprisingly cheap for an Ultimate since most of its effects either cost little for big change or just don't translate well and I've left them out. In-game it increases movement speed and attack speed and makes him immune to slowing spells, with an added bonus of cooling down all spells on a champ kill. The movement bump became an Athletics bonus, attack speed an attack bonus (to improve the odds of getting a high degree Multiattack) and a 5-point Immunity seemed appropriate. I put Tiring and Sustained on the lot to limit its use (stack Highlander with Wuju and you get a PL12 attacker for one round! ), the intent being one Extra Effort exertion to activate Highlander and free actions to sustain it for several rounds (or until stunned), but I may be misusing that. Finally, the Double Strike passive of hitting twice every 7th attack I just translated to Improved Critical 2, since 18-20 = 15% ~ 1 in 7. Ok, not quite finally. Look at Yi's picture a moment. For me, I don't notice the sword until AFTER I get a load of Yi's crazy headgear. It's looks like a medieval interpretation of special ops nightsight goggles or something, but there's absolutely no mention of it in his backstory or his power descriptions, and even his Judgement only barely mentions that it exists. For the heck of it, I built it as a sensory device to give it some function to go with the form. The mightiest warrior ever to emerge from the minotaur tribes of the Great Barrier, Alistar defended his tribe from all of Valoran's many dangers; that is, until the coming of the Noxian army. Alistar was lured from his village by the machinations of Keiran Darkwill, Baron Darkwill's youngest son, and commander of the Noxian expeditionary force. When Alistar returned home, he found his village burning and his family slain. Bellowing with rage, he charged an entire regiment of Noxus's elite, slaughtering them by the hundreds. Only the intervention of some of Noxus's most skilled summoners checked Alistar's rage. Brought in chains to Noxus, Alistar spent the intervening years as a gladiator pitted in endless battle for the entertainment of Noxus's wealthy leaders. Alistar's once noble soul slowly twisted, and he would have been lost to insanity if not for Ayelia, a young servant girl who befriended him and eventually arranged for his escape. Suddenly free, Alistar joined the newly-formed Institute of War as a champion, hoping to one day visit his final vengeance against Noxus and to find the girl who once again gave him hope. Motivation: Justice: Alistar joined the newly-formed Institute of War as a champion, hoping to one day visit his final vengeance against Noxus and to find the girl who once again gave him hope. Temper: After seeing his village burned and family slain, followed by years in forced gladitorial combat, Alistar has a temper to be feared. I recently got the GM Kit with the Quick Character Generator included and have been loving it so much! The ability to whip together a random character (or selecting rough guidelines for one) and getting a playable, mostly balanced character in a few minutes is nothing short of awesome. I decided it might be yet another handy tool in my arsenal of LoL conversions so I've redone Alistar using the QCG. I added a few more Advantages and Skills than one would normally roll for since they fit his character well, but balanced it out a little by removing Ranged Combat (Alistar never throws anything in-game, getting his "ranged" attacks with AoEs and Charges) and a few skill ranks. Considering his size, I decided to go with Growth 4 + Density 4, making him under 15' tall and less than 25 tons. A bit heavy, admittedly, but we'll see how he tests. The Strength & Courage Array is still most of his abilities in one array, but I've reworked all of them. Pulverize is in fact a linked combo of the QCG Groundstrike and Pulverize, which I'm leaving as written for now. Headbutt was surprisingly inexpensive for what I wanted, but I found a use for all that slot space. Rather than use the Knockabout rules, I adapted one of the few official 3e Knockback character effects from Anvil's Bowling Ball attack. The Reaction Extra maybe a little overkill, since it would mean that Alistar would knock back anybody he touched on his way to his Slam target. Awesome, but possibly OP for the effect. I completely retooled Triumphant Roar when I realized standard minions would get NO BENEFIT from his Area Healing. Going back to the concept is that Alistar is inspiring them to ignore their wounds and fight, I realized I could give the minions temporary (Fading) Toughness, which should work more like LoL healing in 3e than I would have expected. PL is an issue, and would become moreso with other Champions, so I linked a similar Fading Impervious Toughness so it would have some useful effect on them as well. In-game, Alistair gets full effect from the Roar and allies get half, so I partial'd the Area for the Toughness boost but left it out for the Impervious since it effectively works at half capacity in 3e anyway. I did throw in Inspire in the remaining slot space, but since it requires HP it likely wouldn't come up as often. Ultimate Will still doesn't fit, and doing it as an alternate effect isn't really workable, so this Alistar is overpointed, unless I can apply Tiring to all the linked effects and still use it with one use of Extra Effort. I'm not sure if that's kosher, but it would mean I'd only be 1 point over. Lastly, his passive ability to do more damage to towers came out as Favored Foe (Architecture), which still make me laugh, especially since 3e FaFoe only gives you a bonus to Interaction skills with your foe, so Alistar will never be fooled by the wily machinations of cunning structures. In practice, I was thinking he should just get a +2 circumstance bonus vs buildings, although under 3e you already get a lot of bonuses beating up on objects. I just found this thread, and even though I don't play LoL (Dota ftw), I'm enjoying it. Keep up the good work! Sojobo wrote: I just found this thread, and even though I don't play LoL (Dota ftw), I'm enjoying it. Keep up the good work! Glad you like it! You may have noticed I used your Traxex build to make Ashe work. I actually never played DotA but I know a lot of the elements from DotA have been transferred to LoL, including various powers and character designs (if not always together). I may go through there again for other Champions. My next two planned Champions are Nasus and Warwick, although I've been having a hard time squeezing them into PL10/150p. I want to finish them for something I want to try out soon, though. No problemo; your builds, and Saltcrows, are inspiring me to try to continue my DotA builds, though giving up my rather arbitrary PL8, 100pp construction guidelines and just go all out PL10, 150pp.